1st ODI India vs New Zealand: Kuldeep Yadav not only emerged as the pick of the Indian bowlers with his sensational four-wicket haul in the ongoing 1st ODI but also took a catch to remember for ages. 1st ODI India vs New Zealand: Kuldeep Yadav not only emerged as the pick of the Indian bowlers with his sensational four-wicket haul in the ongoing 1st ODI but also took a catch to remember for ages. Not known as a brilliant fielder, Kuldeep took a screamer diving towards his right, which is his wrong side. The incident happened in the 24th over of the match, the bowler was Kedar Jadhav. 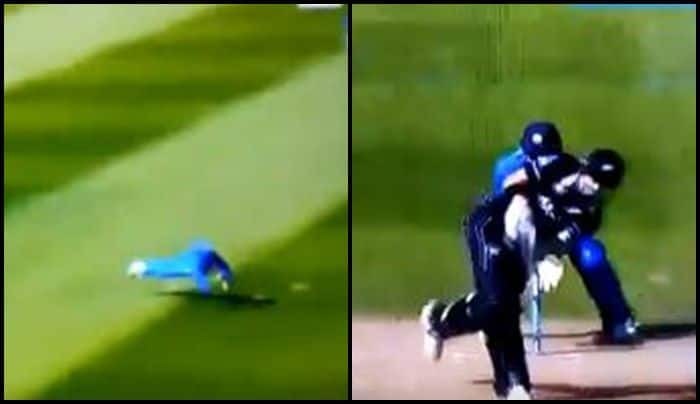 Nicholls looked to flick an overpitched ball towards the leg-side, but he could only find a ‘flying’ Kuldeep. India has been top-notch in the field and that has also been one of the major reason for their success of late. Earlier, New Zealand won the toss and opted to bat against India in the first One-day International of the five-match series on Wednesday. Both wrist spinners – Kuldeep Yadav and Yuzvendra Chahal – figured in the India playing XI, apart from all-rounder Vijay Shankar. Dinesh Karthik has been dropped at the expense of Ambati Rayudu, while Kedar Jadhav retained his place. Mitchell Santner and Doug Bracewell returned for New Zealand. The Kiwis were bundled out for a paltry 157. At the time of filing the copy, India was well-placed at 94/1 in 20 overs with Kohli and Dhawan at the wicket. Rohit Sharma departed early for 11 runs off 24 balls.